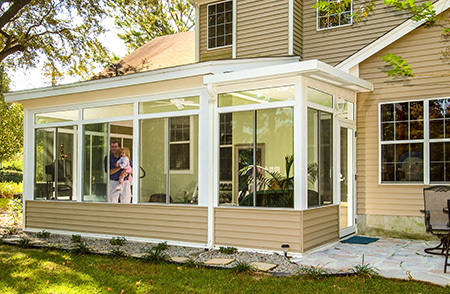 Having a patio cover installed at your Warminster, Pennsylvania, home by SRA Home Products will allow you and your family to enjoy fresh outdoor air while staying protected from inclement weather and the sun’s harmful UV rays. This structure, which will boast a solid thermal roof that deflects the sun’s heat, can be installed on the front or back of your home in either a freestanding or attached design, so you can have this invaluable protection where you need it most. Strength – Our patio covers are made of heavy-duty extruded aluminum, which is much stronger than the roll-formed aluminum, vinyl, and wood materials used by other manufacturers. 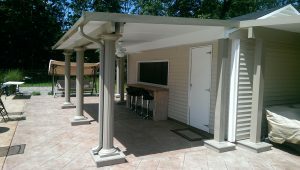 Durability – Our patio covers won’t chip or peel, and require little-to-no maintenance to keep them looking their best. 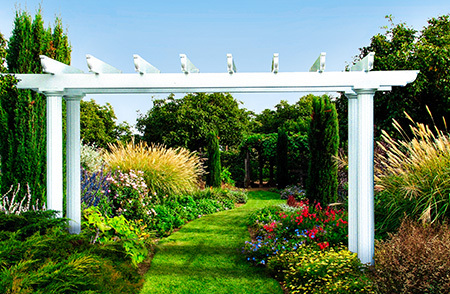 Style – Our patio covers can be fitted with one of several gorgeous Mediterranean-inspired column styles. Protection – TEMO’s limited lifetime transferrable warranty will ensure your patio cover remains secure for years to come. When you purchase a durable TEMO patio cover from SRA Home Products, you can take comfort in knowing it will be installed seamlessly by our in-house factory-trained and -certified technicians. Because we will never enlist the help of subcontractors, you can be sure that every craftsman who shows up at your home will have the knowledge and experience to get the job done right the first time, and will remain respectful of you and your home every step of the way. If you are interested in having SRA Home Products install a patio cover at your home in the Warminster, PA, area, contact us today. Our team is standing by and will be glad to answer any questions you may have.